Don’t Leave $$$ on the Table! Funding is limited: lock in your scholarship now for the 2019-2020 academic year. Scholarships are awarded based upon availability of funds. Financial need and a minimum GPA are required for some scholarships. Students are required to complete a Free Application for Federal Student Aid (FAFSA). Scholarships are available for international and non-U.S. citizen students. International students should complete the 2019-2020 Dreamers Financial Aid Application available online and from the Financial Aid Office. Deadline to apply for scholarships is Friday, May 24, 2019. Learn more by emailing Financial Aid or calling 505-428-1268. Se habla Español. If you are a first generation college attendee who can demonstrate financial need, a high school or high school equivalency (HSE/GED) graduate, have a current FAFSA on file in the Financial Aid Office and are not receiving financial aid at another institution you may be eligible. CBT applicants must also be first time degree-seeking students who have not received a two-year or four- year degree and must enroll in at least nine credit hours at SFCC. FAFSA website. View the Federal Financial Aid Regulations that impact you. Students applying for a student loan must have all previous college transcripts in the Registrar’s Office before submitting the loan application. Evaluation of transcripts can change loan eligibility if a student has not completed the last two semesters at a previous institution. Students must be registered in courses from their current primary declared degree program to be eligible for student loans. HPER courses will not count towards loan eligibility. Spring loan application available through May 4, 2019. Summer loan application available through July 12, 2019. For the first four-week class session in the Summer 2019 semester, Financial Aid will pay into student college accounts during the week of June 17. Financial aid is only disbursed for classes you are actively attending. If you have late-starting classes your full disbursement may be delayed until after the late-starting classes begin. For the eight-week classes in the Summer 2019 semester, Financial Aid will pay into student college accounts during the week of June 17. Financial Aid is only disbursed for classes you are actively attending. If you have late-starting classes your full disbursement may be delayed until after the late-starting classes begin. The Cashiers Office will issue refunds via direct deposit or check the week of June 24, 2019. Please click the Financial Aid Disbursement General info link for detailed information regarding disbursements for late starting classes and instructions on setting up direct deposit. The payment deadline for the Summer 2019 semester is May 16, 2019. Students must have financial aid or a payment plan in place by then to avoid being dropped from classes for non-payment. Some grant and scholarship funds are limited, so we encourage students to file as soon as possible to maximize their award. Students should fill out their FAFSA by May 1 each year for the upcoming Fall term. If you don’t apply by May 1, your application will still be processed for Fall, however, the available funds may be limited. Call Student Employment Program Manager Susie Weaver at 505-428-1285 or go to Student Employment. Students who transfer from other colleges or universities and wish to complete a degree or certificate at SFCC must request that each institution they attended send official transcripts to the Registrar’s Office. Credit hours that are transferred from institutions previously attended will count toward a student’s Satisfactory Academic Progress. Attackers are using a phishing email to obtain access to student accounts via Colleges’ student portals. Upon gaining access to the portal the attacker changes the student’s direct deposit destination to a bank account controlled by the attacker. SFCC will NEVER ask for you to provide passwords or personally identifiable information. DO NOT click on links that are provided in an email. CONTACT US with any questions! 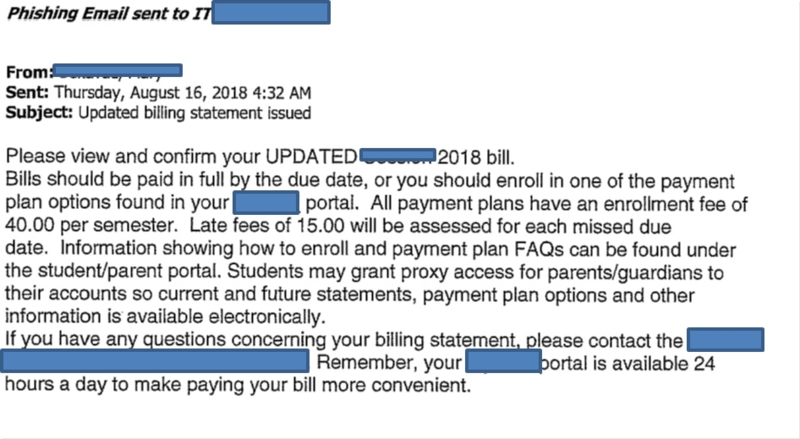 Documents you email to the Financial Aid Office are not encrypted which means your personal information is vulnerable to attack. We are invested in protecting your privacy! We can provide you with a safe, secure method to provide your documents to the Financial Aid Office electronically. If you would like to submit your documents electronically please email financialaid@sfcc.edu with a request for a secure link. Your email must come from your SFCC email account and include your Student ID number. The Financial Aid Office will provide you with access to an encryption service along with instructions on uploading documents. If you do not wish to provide your documents electronically you may fax them to us at (505) 428-1283 or bring them by the Financial Aid Office in person. Located in Room 202 of the Welcome and Advising Center; we are open 8-6, Monday through Thursday and 8-5 on Friday. Federal regulations require that all financial aid inquiries come from your school e-mail address. Please e-mail all financial aid questions from your SFCC email account. Log into MySFCC, access email account by clicking on the Gmail link in the Launchpad, and create a new email using “financialaid@sfcc.edu” in the address bar. SFCC offers 21 Certificate Programs that qualify for Financial Aid. Please visit our Grants web page to see eligible certificates.